STATEWIDE — Three marlins weighing almost 1,500 pounds combined and caught off the San Diego coastline in a one-month span received a fair share of media attention in September and October. Warmer waters meant more marlin being caught in local waters. What best practices should anglers be aware of whenever a billfish is biting at the other end of the line? A marine life scientist and game fish conservationist provided some perspectives of how everyone can enjoy marlin fishing without depleting the species. An angler recently shared photos of marlin brought into Oceanside, joining a growing list of billfish captured within U.S. waters and weighed in at shore. The marlin hauled into Oceanside late last month reportedly weighed 510 pounds. Another angler weighed his marlin catch at Shelter Island in San Diego in late September; it tipped the scale at 662.2 pounds. A third marlin was caught on Oct. 13 near the 9 Mile Bank and reportedly weighed-in at 315 pounds. Total weight: 1,487 pounds. At least two of the anglers said the marlin they caught could not be released, what with one already dead when it was reeled aboard and the other, in his judgment, on the verge of flat-lining. Jason Schratwieser, the International Game Fish Association’s (IGFA) conservation director, said marlin might die after a long fight but the billfish can be quite resilient. “After a long fight marlin may sometimes die but just because the fish has faded coloration and is sluggish doesn’t mean it’s a gonner,” Schratwieser said. He shared a story of a marlin caught in a tournament and left for dead that actually survived. “In general minimizing fight time, using circle hooks with bait and taking the time to revive exhausted fish are some of the best things you can do,” Schratwieser said. Both Schratwieser and Siddall say El Niño conditions contributed to the existence of marlin in U.S. waters. “Most marlins are tropical species and the warm waters associated with El Niño have allowed blue marlin (especially) to expand their range temporarily into southern California waters,” Schratwieser said. 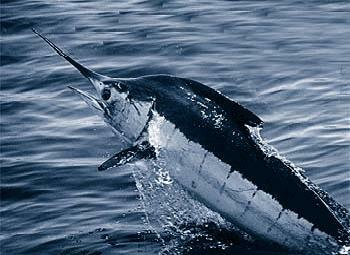 Worldwide marlin populations are low, spawning federal legislation to protect billfish. IGFA initiated a billfish preservation program called “Take Marlin Off The Menu” while The Billfish Foundation advocates marlin conservation with an annual International Tag and Release Competition. Schratwieser testified about marlin stock assessments before the House Natural Resources Subcommittee on Fisheries during deliberation of the Billfish Conservation Act, which was signed into law by Pres. Barack Obama in 2012 and prohibits commercially caught billfish (marlin, sailfish and spearfish) from being imported into the United States. Every marlin battle is unique. There is no hard-and-fast way to ensure all anglers fully enjoy the pursuit of a marlin before releasing the billfish into the water. Both IGFA and The Billfish Foundation actively promote anglers using proper catch-and-release techniques with caught marlin. A caught marlin, when properly handled, have a high chance of survival when released, according to Siddall. Schratwieser said a vast majority of marlin released by recreational anglers continue navigating the ocean. “Catch-and-release recreational fishing poses little threat to marlin populations. Studies have demonstrated 85 percent or more of marlin caught by recreational anglers survive,” Schratwieser said. The Marlin Club in San Diego reported 32 marlins were caught by recreational anglers between July 31 and Sept. 26; 23 of them were released. How a marlin is caught influences its chances of surviving upon release. The position of the marlin in relative position to the boat and how long the billfish is held in water are vital factors to survivability. Anglers battling marlin for hours or photographing the catch for extended amount of time negatively impact the billfish’s chances of surviving a catch. What steps are currently being taken to formally protect marlin? “The short answer is not nearly enough,” Schratwieser said. Enactment of the Billfish Conservation Act of 2012 also helped but more work still needs to be done, Schratwieser added. Conserving black and blue marlin in U.S and Mexico waters means more anglers will have the opportunity to experience billfish action, Siddall added. “We hope everyone gets a chance to get on the water and experience catching these amazing fish,” she said.